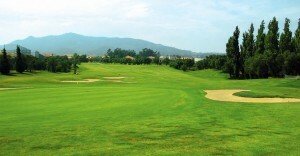 Quinta da Beloura Golf Course is located in one of the most prestigious areas of Portugal. The historic town of Sintra and the cosmopolitan resorts of Estoril and Cascais are just a few kilometres away and Lisbon international airport is within easy reach. The foothills of the Sintra Mountains offer a breathtaking backdrop to the Quinta da Beloura Golf Course. The course, designed by the famous American golf course architect Rocky Roquemore, will stretch both your imagination and your golfing skills, providing an enjoyable challenge to golfers of all levels. The course has excellent practice facilities and well-qualified teachers. There is a magnificent clubhouse with a golf shop where golf equipment can be bought or hired. The clubhouse is the heart of our resort. It is centrally located and has a range of excellent facilities. The bar and restaurant are elegant and comfortable and the atmosphere relaxed. Food includes carefully prepared local and international dishes. The Business Centre offers a luxurious environment well away from the stress of the city. It is an ideal setting for meetings and conferences. While at Quinta da Beloura, work out or just relax in our fully equipped fitness centre. Facilities include changing rooms, a sauna, a Turkish bath, a jacuzzi and a gym with a good range of exercise machines. There is no better place to lose a few extra pounds, tone up your muscles or take the stress out of your day. For business or leisure, Quinta da Beloura offers a wide range of services. Our friendly, efficient staff will make sure that you enjoy yourself to the full.